How we regret not watching the Oscars this morning! Our Twitter and Facebook feed is full of clever Oscar/Kirk comments but the real hero of the night has to be Seth Macfarlane. He is an inspiration to all Trekkies demonstrating that no matter what you do, make sure you include some Trek goodness. Here is Seth’s opening staring William Shatner as Captain Kirk. We think we hear a sneaky Qapla’ after one of Seth’s number. What do you think?…Seth?…phone us? Marry us both like Mormons Bolians. William Shatner looked fab in his TWOK maroons which we suspect might be Anovos? 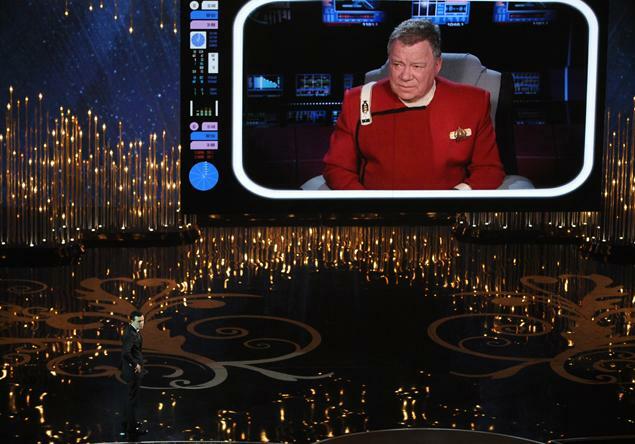 He may have been sat in Kirks seat but he was definitely playing the strait-faced, in-your-face Shatner persona we love. Maybe with a bit of family guys Brian mixed in!? Also at the Oscars were the other Captain Kirk, the deliciously handsome Chris Pine looking fiiiine and our stunning Uhura, the beautiful Zoe Saldana. Nice tux Chris but next time see Garak, he’ll get you fixed up with some Autumn colours, funky textures and killer shoulder pads.